A damning report into Pentonville Prison has revealed "endemic squalor" at the oldest Victorian era jail. Rat and cockroach infestations are a serious problem at the centre, according to the report from the prison's Independent Monitoring Board. The report also revealed insufficient staff to cope with double the number of prisoners the site was built for. The Prison Service said a new governor and management team were "urgently addressing the prison's problems". But inspectors said the state of the prison should be a matter of "deep shame" for government ministers. It described the prison as a place of "endemic squalor and poverty of regime which ought to be a matter of deep shame to government in 21st Century Britain". Other problems identified included the detention of mentally ill prisoners in unsuitable conditions, inadequate facilities for the reception of prisoners and a "lamentably poor" library. And in some cases, basic needs such as clean clothing, showers and toothbrushes are not met, the report said. The prison, which was built in 1842, has the capacity to house 1,127 inmates at its grounds in north London. 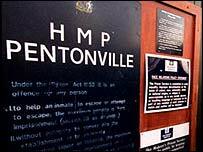 Juliet Lyon, director of the Prison Reform Trust, said: "This report reveals the appalling conditions at Pentonville. Still it seems to be the poor relation of the prison system, grossly overcrowded, under-resourced and neglected." She added: "The question remains: can Pentonville be rescued or should this London dungeon be closed down as unfit for human habitation?" A spokesperson for the Prison Service said: "It is a matter of public record that Pentonville is an overcrowded local prison facing significant problems. "The new governor and a strengthened management team are urgently addressing the prison's problems, but it is one of our busiest prisons with one of the highest number of receptions and is operating at maximum capacity. "It is the oldest Victorian prison in the country and is in need of significant refurbishment. "The area manager and the governor are currently identifying the areas in most need of investment to ensure improvements for prisoners are delivered."